We all understood that certain senior personalities were lying when the Secretary of State for Justice and Director of the FBI, Robert Mueller, revealed the names of the 19 presumed hijackers, because we already had in front of us the lists disclosed by the airline companies of all of the passengers embarked - lists on which none of the suspects were mentioned. The Secretary for Defense, Donald Rumsfeld, created the Office of Force Transformation, under the command of Admiral Arthur Cebrowski, who immediately presented a programme, conceived a long time earlier, planning for the control of access to the natural resources of the countries of the geopolitical South. He demanded the destruction of State and social structures in the half of the world which was not yet globalised. Simultaneously, the Director of the CIA launched the « Worldwide Attack Matrix », a package of secret operations in 85 countries where Rumsfeld and Cebrowski intended to destroy the State structures. Considering that only those countries whose economies were globalised would remain stable, and that the others would be destroyed, the men from 9/11 placed US armed forces in the service of transnational financial interests. They betrayed your country and transformed it into the armed wing of these predators. For the last 17 years, we have witnessed what is being given to your compatriots by the government of the successors of those who drew up the Constitution and opposed at that time - without success – the Bill of Rights. These rich men have become the super-rich, while the middle class has been reduced by a fifth and poverty has increased. Thierry Meyssan brought to the world stage the debate on the real perpetrators of 11 September 2001. He has worked as a political analyst alongside Hugo Chavez, Mahmoud Ahmadinejad and Mouamar Kadhafi. He is today a political refugee in Syria. 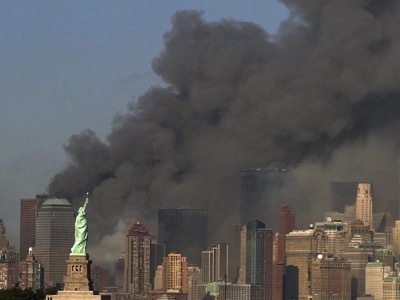 See : Memoranda for the President on 9/11: Time for the Truth — False Flag Deep State Truth!, by : Kevin Barrett; Scott Bennett; Christopher Bollyn; Fred Burks; Steve De’ak; A. K. Dewdney; Gordon Duff; Aero Engineer; Greg Felton; James Fetzer; Richard Gage; Tom-Scott Gordon; David Ray Griffin; Sander Hicks; T. Mark Hightower; Barbara Honegger; Eric Hufschmid; Ed Jewett; Nicholas Kollerstrom; John Lear; Susan Lindauer; Joe Olson; Peter Dale Scott; Robert David Steele; and indirectly, Victor Thorn and Judy Wood.